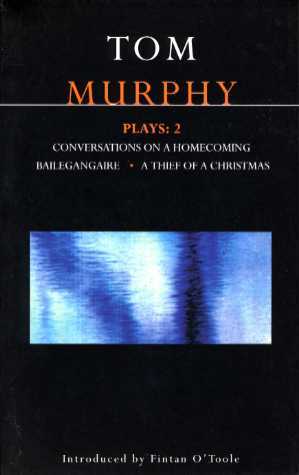 Sandwiched between The Gigli Concert and Bailegangaire, Tom Murphy&#146;s Conversations on a Homecoming was first produced in 1985. Taking place in the West of Ireland in the early 1970s, it is a reflection on the ideals and idealism of the 1960s–dead to the world of the &#145;70s and barely a memory to the &#145;80s. It is a peculiar mixture of abstraction and naturalism characteristic of its author, but less sharply focused. Set in a run-down pub which once doubled as a social club for idealistic young Irishmen inspired by the election of Irish-Catholic descendant John F. Kennedy to the presidency of the United States, all of the action takes place over a temporally-accelerated single night where the passage of time is marked by the bells of a nearby Church. Michael (Conleth Hill) is an actor who has recently returned home from New York. It is not his first visit, but his misty-eyed remembrance of the heady days when he left seem to suggest that he has decided to remain at home this time, possibly even rebuilding the club in the process and restoring it to its former glory. Old friends Tom (Adrian Dunbar), Junior (Frankie McCafferty) and Liam (Vincent Higgins) join him for a drink and a night of conversation, but they do not share his sentiments about either the Ireland of the present or that of the past. It is simple enough to see what Murphy is trying to say with this play. Its explicit concerns with the schism between idealized memory and the bitterness of lived experience are so clearly stated that it would be impossible to avoid them. The play also delves into a range of ancillary concerns about economics, politics, sexuality, family, religion, education, art, and generally anything pertaining to what amounts to a meditation upon the meaning of (Irish) life. Characters frequently stand up and make speeches about them. They are drunk, yes, and thus the boundaries of naturalistic form are stretched rather than broken, but it is difficult to see the sequence of lengthy diatribes by one character or another on one issue or another as anything other than Murphy himself sounding off on a variety of themes. The play is very loosely structured. It is organized around interlaced and not unconnected strands of argument and observation which become increasingly hostile as the drink flows ever more freely. "Let that be the end of the time for insults, and the start of the time for singing," says Junior at one point, presumably signaling that the playwright is aware of the narrative choices he has made. The difficulty is that this structure combined with the predilection for lengthy recitation (Tom, a schoolteacher, even gets to spend several minutes quoting Shakespeare) makes the play feel random and unnecessarily fragmented. There may be a certain logic to this choice of form insofar as these people are getting progressively more drunk, and there is discernible method behind it from Murphy&#146;s point of view, but this doesn&#146;t necessarily make it effective. Although Conversations on a Homecoming is intentionally anachronistic, it feels dated. There is a surrealistic otherworldliness to the setting, and the outlandish costumes and hairstyles trigger more laughter than recognition, all of which contributes to the sense that Murphy is dealing in &#145;other&#146; spaces here. But again, though the audience understands it, this does not make the experience of seeing and hearing it any more exciting. Rants on socialism and idealism delivered by the character of Tom (who shares the name of the playwright) feel very much of their time of the play&#146;s writing rather than an accurate reflection of the mindset of the time in which it is set, and its reading of the 1960s as the moment of optimism and progress sits uncomfortably with Murphy&#146;s own searing take on Irish identity at the time in A Whistle in the Dark. The Lyric Theatre&#146;s production offers a strong line-up of actors, all of whom make a creditable stab at handling the rapid character change and oscillating mood. Higgins is partly amusing and partly (deliberately) embarrassing as the Country and Western obsessed real estate salesman who sings homages to his pony and speaks like John Wayne. The actor does register a certain pathetic quality which speaks volumes about the world of the play, just as McCafferty portrays a sense of intentional vapidity. Dunbar and Hill are at the center of the action, and both have sufficient experience to hold it together. Their quasi-elliptical, half-unspoken exchanges feature many difficult transitions of tone, and both manage this well. Support from the female cast (Barbara Adair, Eleanor Methven, and Lesley-Ann Shaw) is less crucial to this very masculine contemplation, though it is equally well managed.